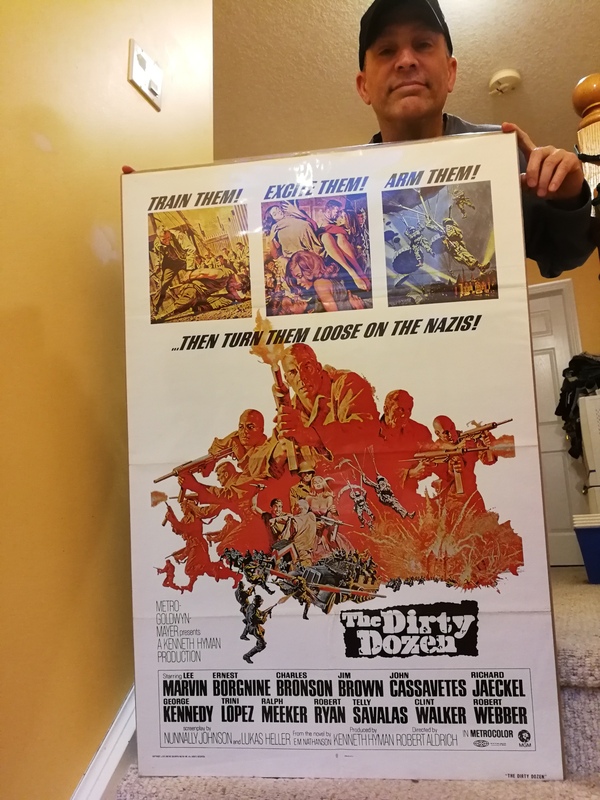 As many of you readers know I’m always on the look out for movie posters, lobby cards and whatever else I can find when it comes to film memorabilia. I’ve also never hid the fact that I have two films I go to when pressured for picking an all time favorite flick. 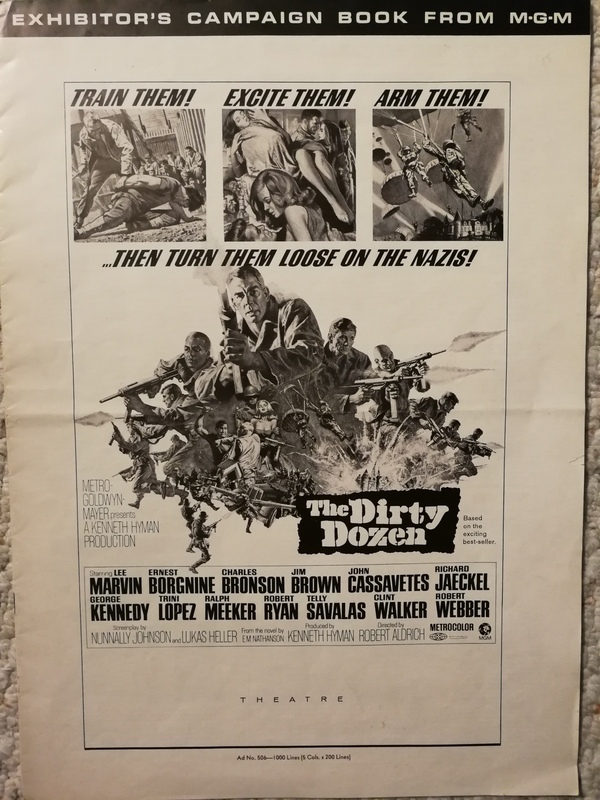 The Dirty Dozen being one, Jaws the other depending on the day of the week. 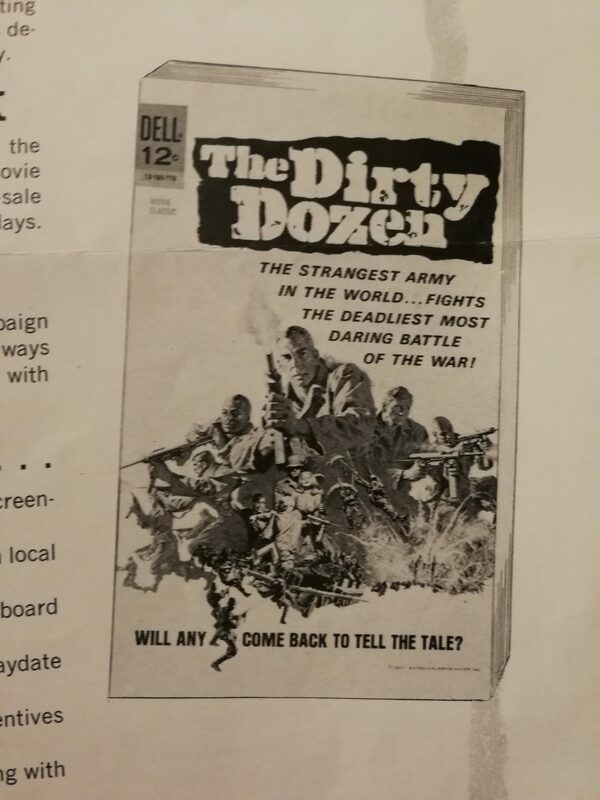 So imagine my delight in coming across an original campaign book for the release of The Dirty Dozen in 1967. 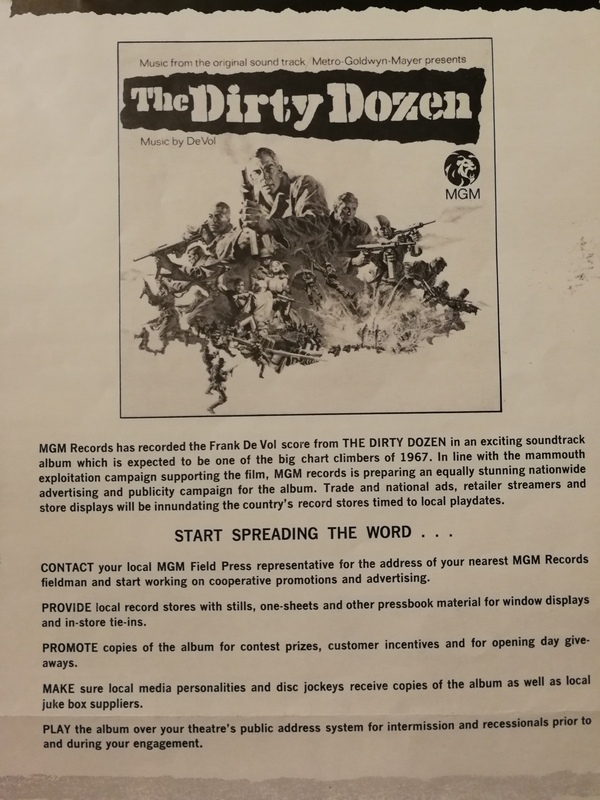 What’s a campaign book you ask? 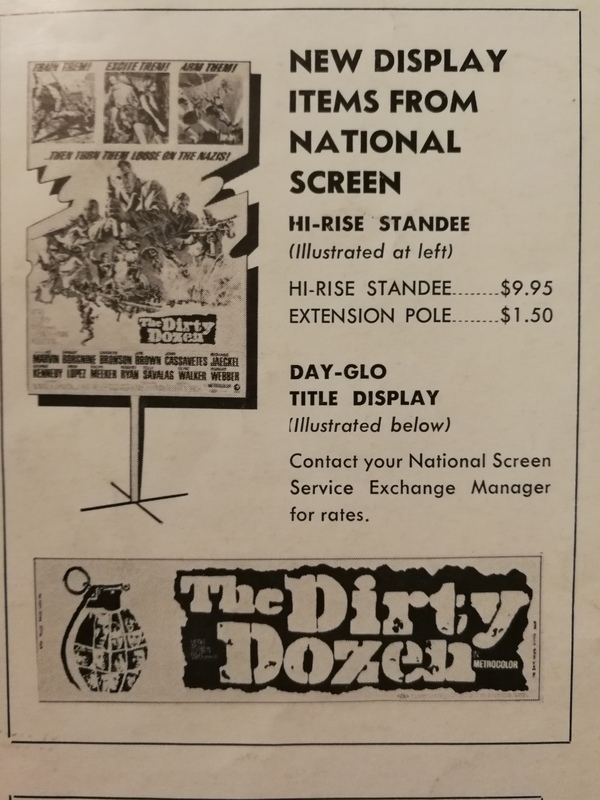 It’s in the form of a magazine packed with articles that newspapers could reprint and various artwork renditions of the movie poster that you’d see displayed in the entertainment section as you go about deciding what movie to take in tonight at a local theater. 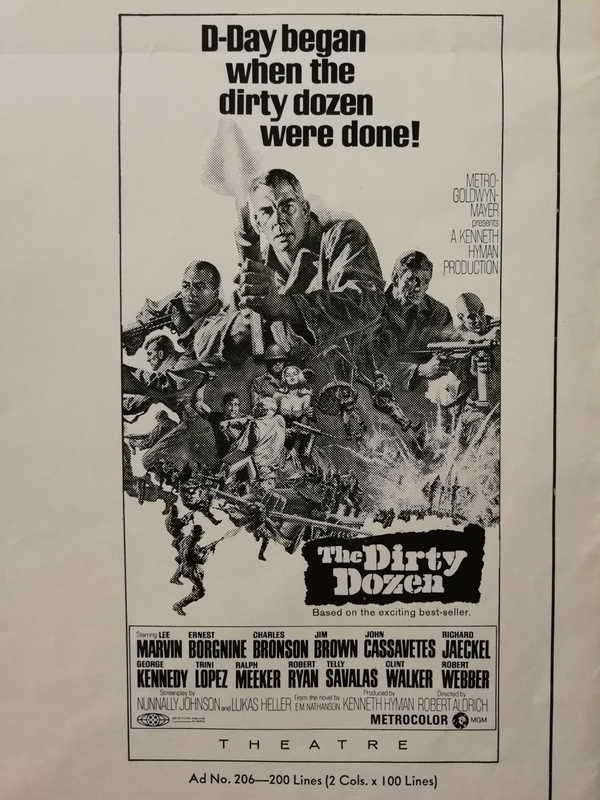 Beyond that are some ideas for promoting the film that by today’s standards are quite hysterical in many cases as you’ll soon see. Stick with it to the last couple photos for some genuine laughs. 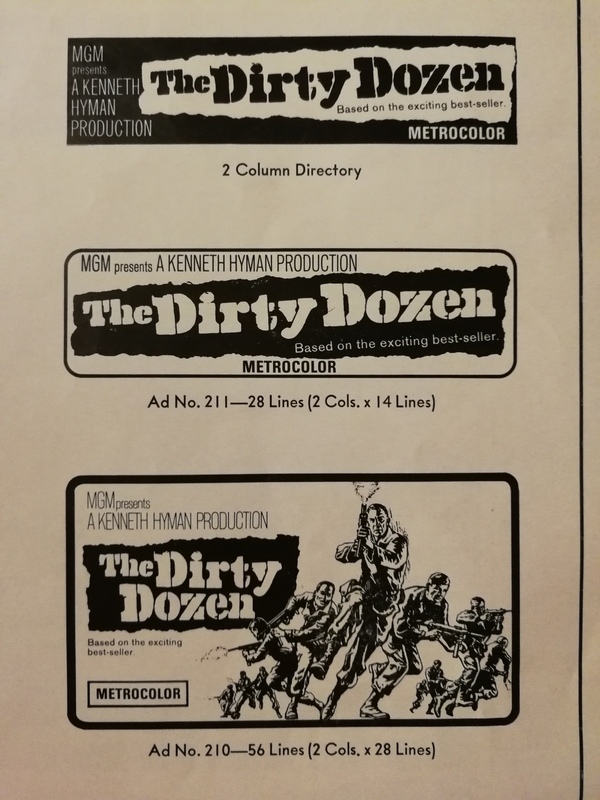 Here are some of the poster renditions for the newspapers. I’d sure love to have one of those display stands above. Makes me wonder if any have even survived to this day. and don’t forget to promote the soundtrack either! Editors could use these timely articles for the weekend editions hoping to stir up some interest on your favorite stars of the film. 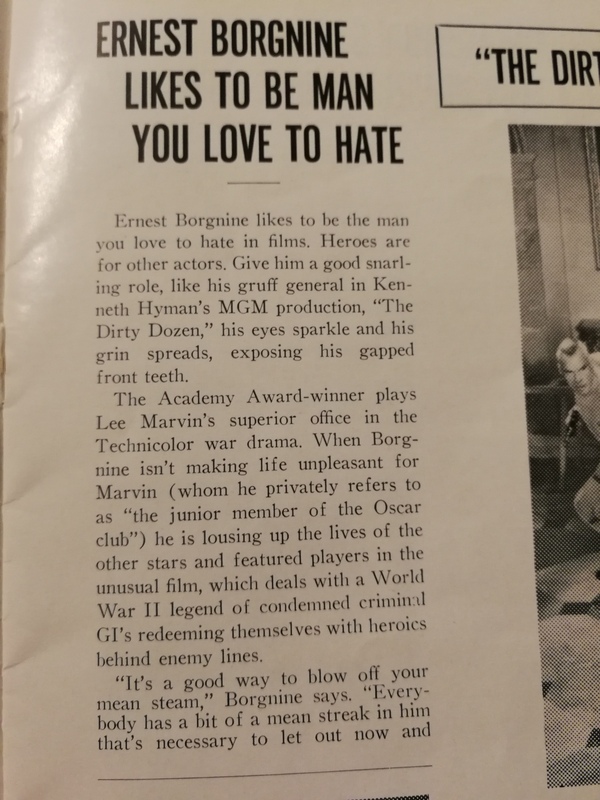 and of course Lee Marvin. And now the promotional tie ins which had me and my sons in stitches at times. First off let’s not forget the kiddies. 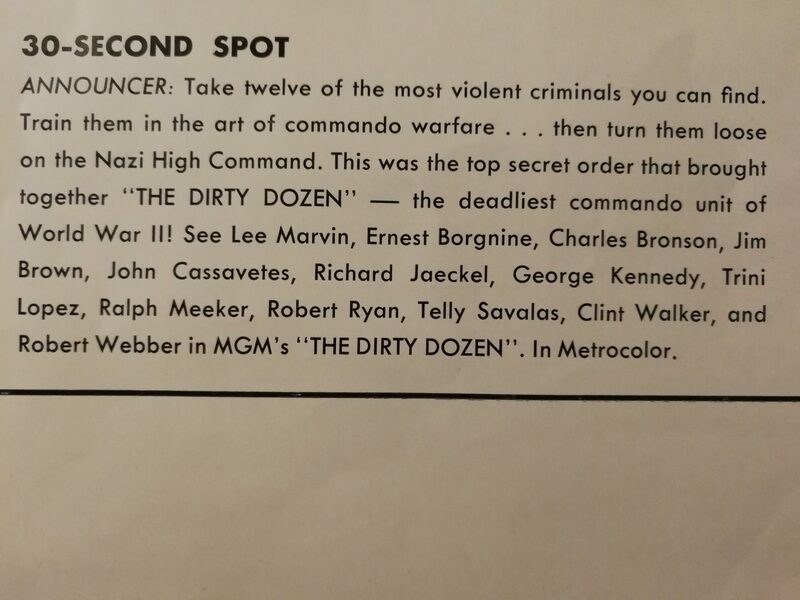 I somehow didn’t see The Dirty Dozen as a matinee for the little tykes but maybe I’m wrong as these two photo’s prove. 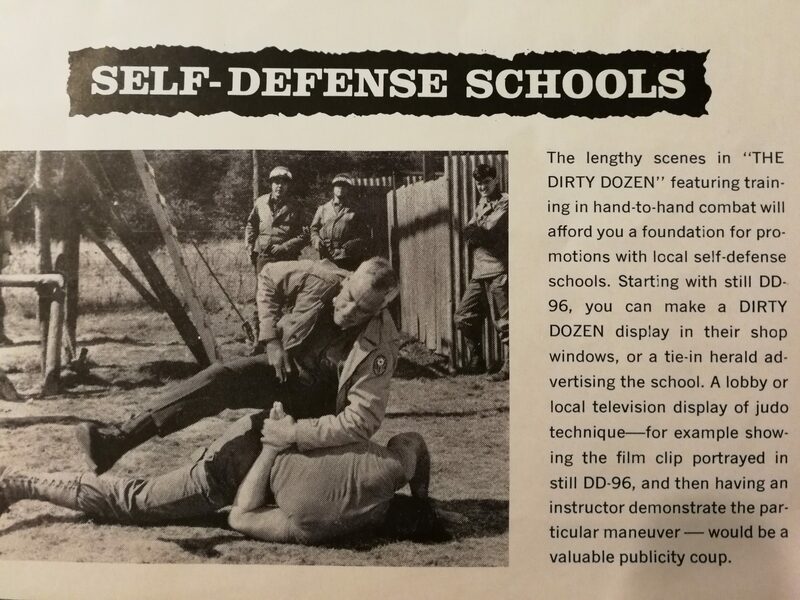 One look at Lee Marvin taking down the biggest man in the unit, Clint Walker, using no weapons other than his self defence training is sure to get people interested in their local training venues. Can you imagine the havoc created in today’s world if we follow suggestion number 2 below? Contests are always a good way to get people in to the excitement of a new big screen release. 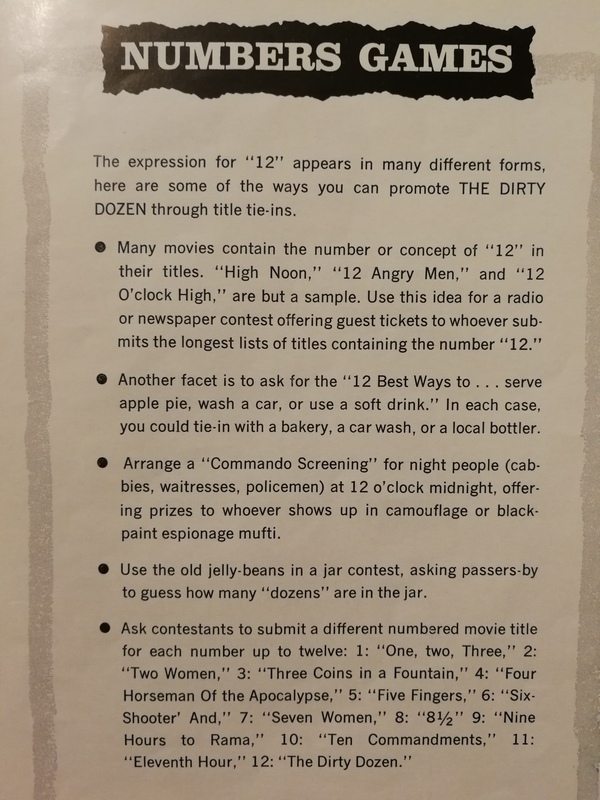 Why not try the numbers game? I’ve saved the best for last as these are laugh out loud funny! 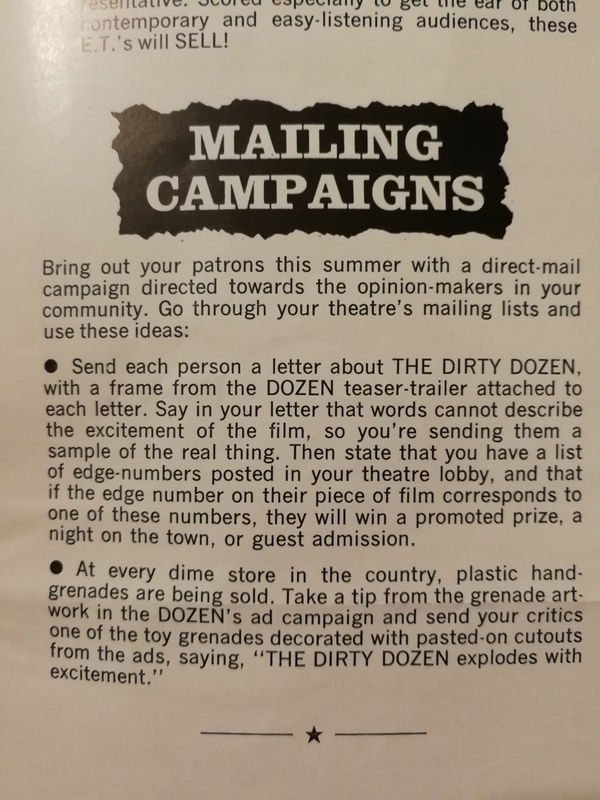 Honestly, these sound like ideas Fred Flintstone and Barney Rubble would use to get Wilma and Betty to go to the movies. The final suggestion is to die for. In closing I’d like to say that this piece of memorabilia fits rather nicely alongside this one sheet I keep here in the vault. So interesting! A branch of the business I was never involved with. Thanks, Mike. 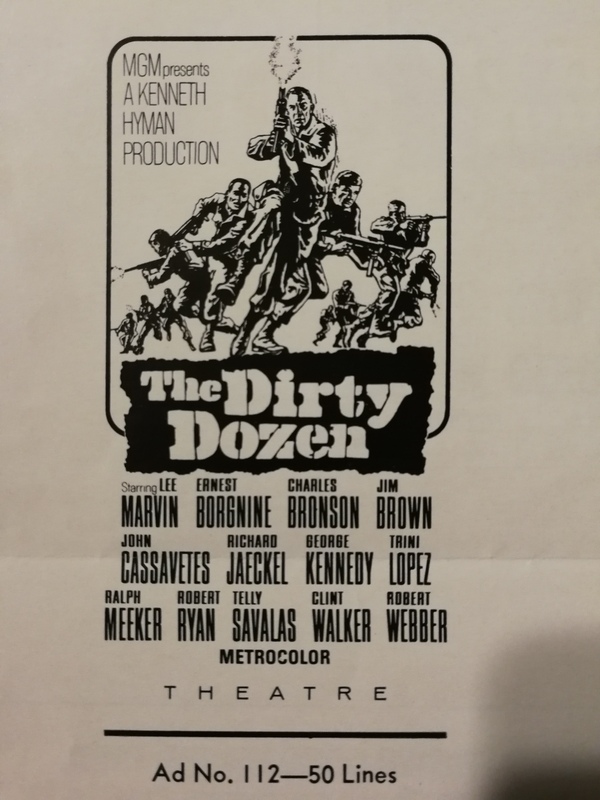 I just think it’s funny that a film like this had these crazy ideas for garnering public attention. I’m sure there are some other funny ideas attached to other titles. I’ll have to look for more of these curios. I agree. I laughed at a good many of them. I hope you can find some more. Seriously WTF hehe the Interest The ladies part as you rightly say is hysterical. I would love to believe it’s someone having a good old laugh but it serious isn’t it! oh my lordy haha. 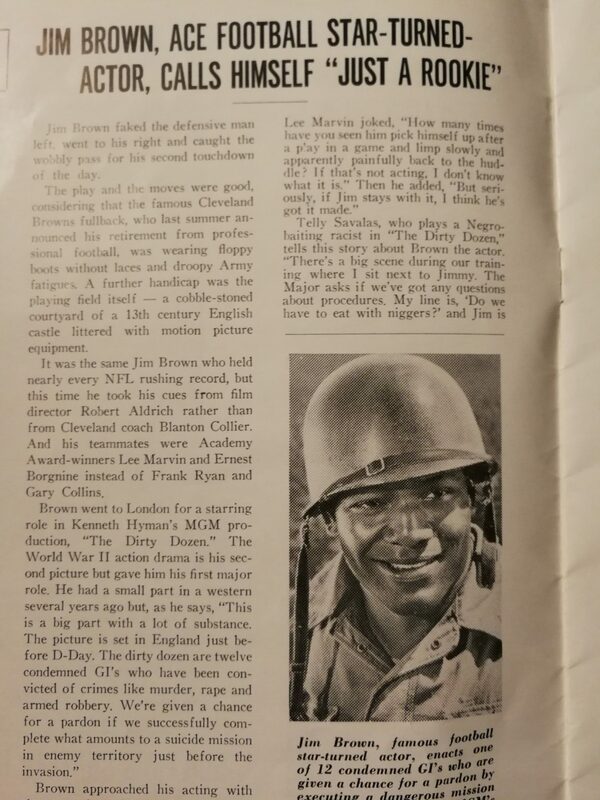 What a fantastic find and thanks so much for sharing. 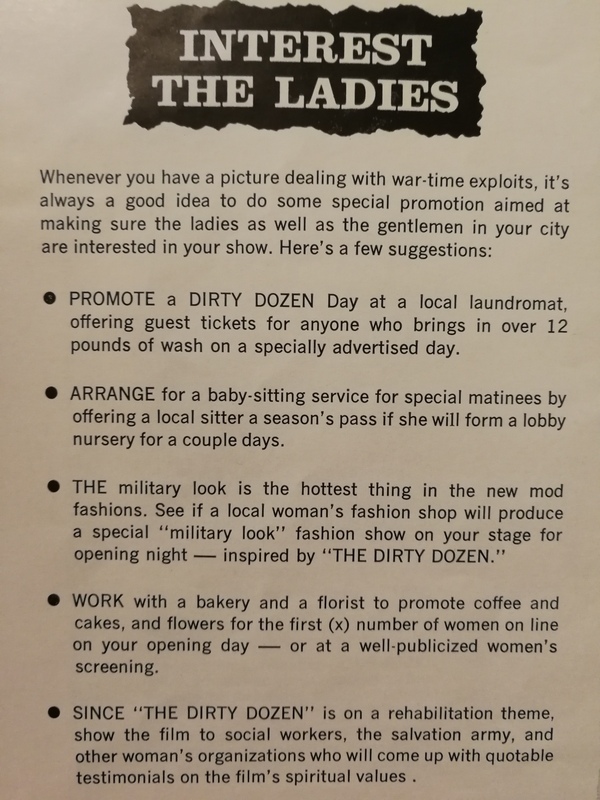 I loved these suggestions to make sure the boys get the women involved to see a movie that at it’s time was blood and guts and the only women in the movie were prostitutes! But think of the spiritual values! 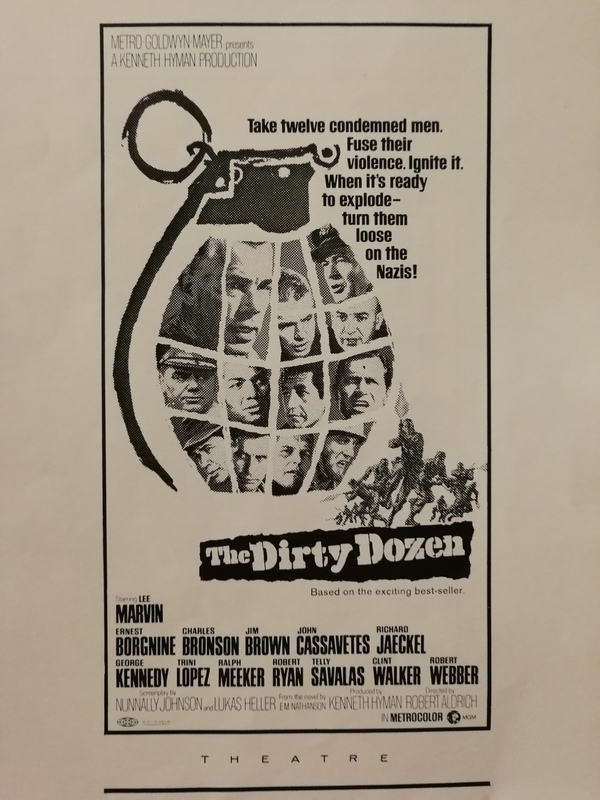 These men seek redemption for their crimes against humanity by blowing the hell out of about 1000 Germans. I’ve seen one of these things for The Great Escape as well. 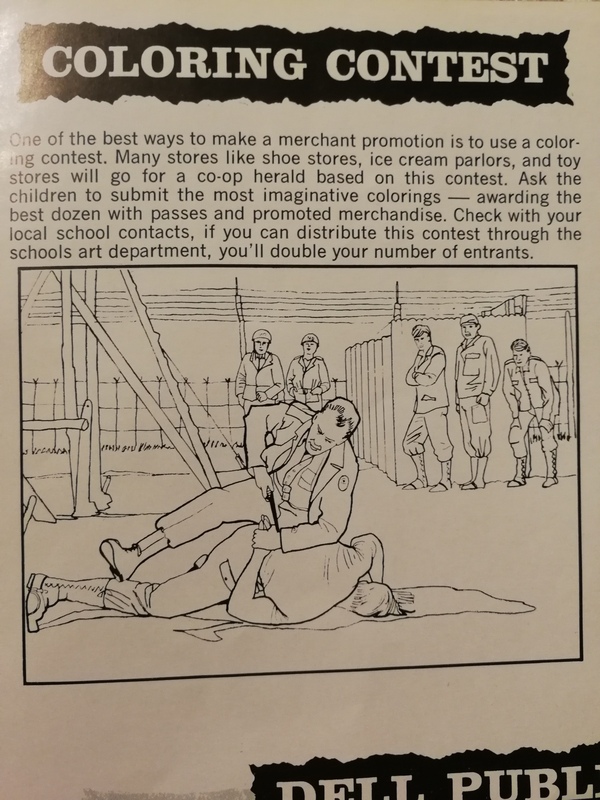 Get people to dress up as guards and prisoners and all these other strange ideas. I especially love the “spiritual values” bit. Isn’t their mission basically trapping a load of German officers plus defenceless women into a cellar and slaughtering them all? 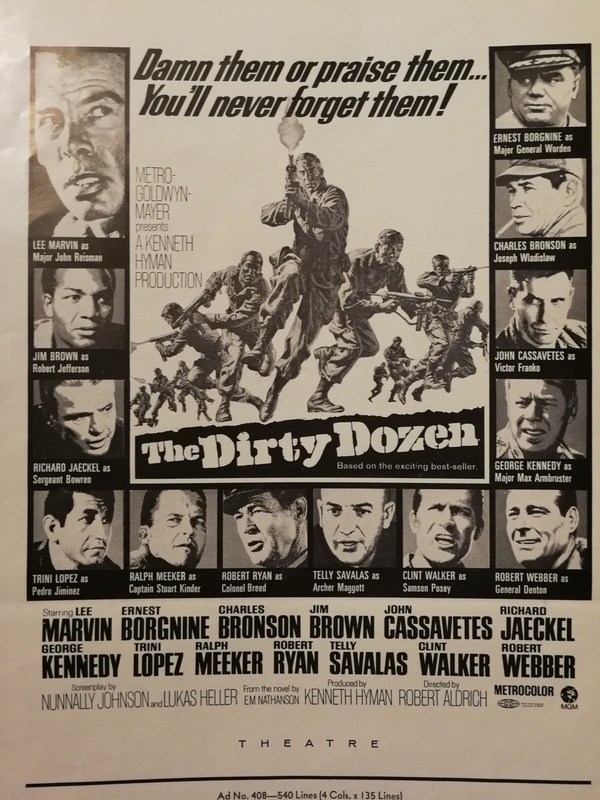 If they think The Dirty Dozen is about “rehabilitation” then they really haven’t understood it at all! 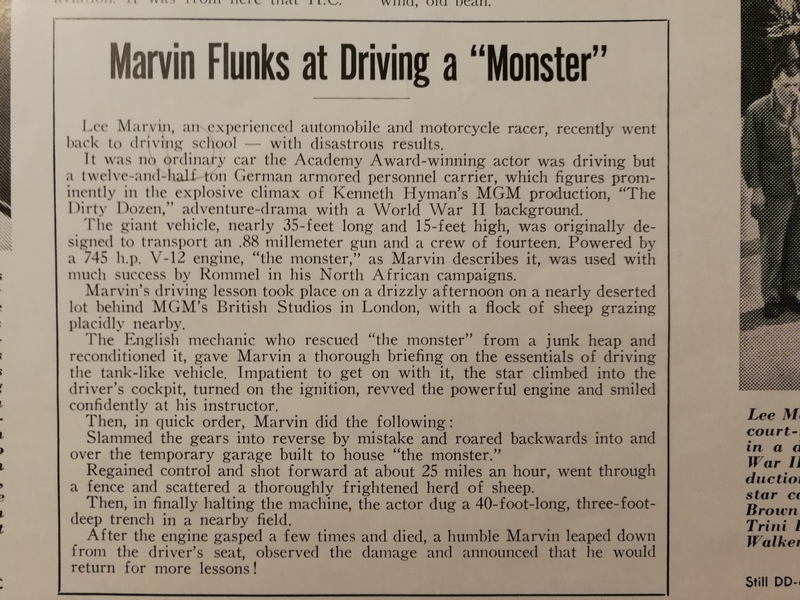 Really is a fun look back into this time capsule.